I mentioned ages ago 2013 was an exciting year for BIC as they were launching a fab new promotional pen – so I just wanted to let you know the Bic Super Clips are now online! You can order from just 250 pens and from a huge range of colours (including mix & match and very lovely pastel shades.) 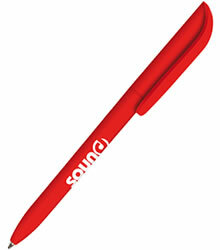 As the name suggests the clip is ‘huge’ and has been especially designed to take a full colour print. For simplicity we’ve priced the pen for either a barrel or clip print – or you can go crazy & get both – wow! Looking forward to seeing the first customer designs on these Super by name Super by nature promo pens! Super Hit Pens – now Super Fast!